The 5-day-old crescent moon as seen from Los Angeles on 2009 November 21 at 7 p.m. P.S.T. For the next few nights, the moon will be a narrow crescentin the western sky after sunset. New moon, when the moon is between the Earth and the sun,was on Nov. 16, and the moon is now moving towards first quarter on Nov. 24. The moon is mostly backlit by the sun at present, so thatonly a thin crescent is in full sunlight. If you look closely at this crescent,you should be able to see the rest of the moon, the full disk, illuminated onlyby the ghostly light reflected onto it by the Earth. This is known as earthshine orearthlight. The most obvious feature on the sunlit crescent is a darkgrey oval towards the top, the Mare Crisium or ?Sea of Crises,? 355 miles (570km) in diameter. The large open plains on the moon were named ?seas? by theearly astronomers, who didn?t know that there was no open water on the moon.This ?sea? is actually a huge scar resulting from the impact of an asteroidbillions of years ago in the moon?s history. If you look at it with a smalltelescope, you?ll see that it bears the scars of many more recent falls bysmaller asteroids. An interesting thing about the Mare Crisium is that itchanges shape noticeably depending on the libration of the moon. Because of itselliptical orbit, the moon doesn?t quite keep the same face always turnedtowards the Earth. As it speeds up and slows down in its orbit, it shows more,or less, of the area close to its edge, as seen from Earth. The Mare Crisium is actually a circular basin, but appearsto us as an oval because of its location ?around the bend? of the moon?ssurface. 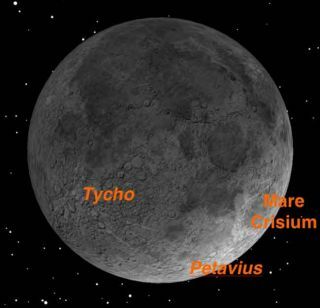 As the moon rotates toward and away from us, this changes Crisium?sproportions from month to month. At this time this month the moon?s librationis close to zero. If you have a telescope, scan the moon?s terminator, theboundary between sunlight and shadow. About half way from the Mare Crisium tothe moon?s south pole is the large crater Petavius. This crater is 110 miles indiameter (177 km) and has a prominent central peak. It also has a beautifulrille on its floor 50 miles (80 km) long. This channel, probably a collapsedlava tube, winds from one crater wall to the central peak, and then back to thecrater wall. If you?re looking at the crescent moon with binoculars or atelescope, be sure to check out the part of the moon in shadow, lit byearthshine. Most of the familiar features visible at full moon are also visiblein ghostlike form on the earthlit moon. Look especially for the bright craterTycho, with its striking system of bright rays radiating from it over themoon?s surface. The earthlit part of the moon is sometimes called ?the old moonin the new moon?s arms. ?